← Sneak Peek of Chicks Dig Comics at the Outer Alliance! Chicks Dig Comics Debuts Today! 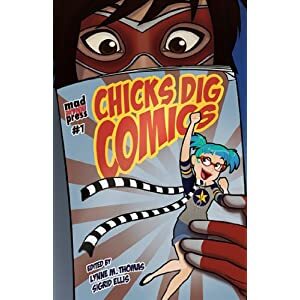 Today is the official street date for Chicks Dig Comics. Special thanks to my co-editor, Sigrid Ellis, for taking on an epic task and executing wonderfully, and to our publisher, Lars Pearson, at Mad Norwegian, for making such an awesome book possible. We could not be more proud, more happy, and more grateful to all of our contributors. They did a fantastic job, and we are thrilled with the book. We hope that you will be, too. Want your very own copy? This entry was posted in Chicks Dig Comics, shameless promotion. Bookmark the permalink. 1 Response to Chicks Dig Comics Debuts Today! Pingback: » Blog Archive » We call this a success.